After learning carpentry by making ramps with his grandfather, Richard built his first marble machine at age 14. He still has the machine, although he has replaced lost and broken pieces over the years. A conglomeration of ramps, levers, and string, the machine originally used 20 marbles to run for about six minutes; the current version runs for three minutes. After a busy couple of years, the machine is 52″ tall and comprises a series of assemblies including elevators, an anti-gravity hill, a scissors jack, and a Ferris wheel. When finished, the machine will take 24 hours to move a marble from the bottom to the top and back down again; the marble will travel nearly 12 miles. Many of the assemblies are removable to make it easy to work on the overall machine and to test the separate gadgets. Richard built his third machine in 2008 as a Christmas gift for his granddaughter, Natalie. Much smaller and simpler than his other two machines, it is 24″ tall and uses 13 marbles. Richard built it after seeing a small plastic machine in a toy catalog. He thought it was neat, but that he could build something better. “So, six weeks before Christmas, I started by cutting out four sides, just making it up as I was going along. I made a bucket thing, a chute-to-chute thing, and a gate inside so the marble went one way one time and the other way the next time, and I made a thing at the top that held 13 marbles and released them one at a time.” The machine runs for several minutes because each marble that reaches the bottom triggers the release of another marble at the top. 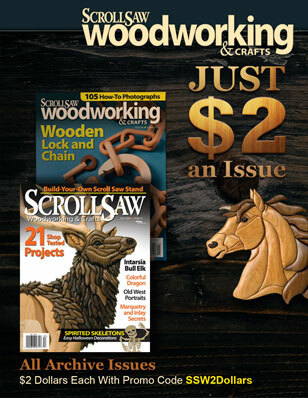 Using Natalie’s machine as inspiration, Richard recently designed a marble machine exclusively for Scroll Saw Woodworking & Crafts. The plans are available in a printed pattern pack or via download at www.scrollsawer.com. The machine is nearly three feet tall, holds 26 marbles, and runs for about six minutes. Like Natalie’s machine, it has two tracks and each marble triggers the release of the next. A complicated piece of engineering designed to exact tolerances, it runs with a pleasing clatter as the 1″ marbles roll, spiral, and swoop through nearly 18′ of track. Richard combines this experimentation with precision. For example, he measured 130 marbles to within thousandths of an inch and realized they tend to be oblong rather than round. Then, he adjusted the ramps until even the least round marble would roll and set the slope at 4°. 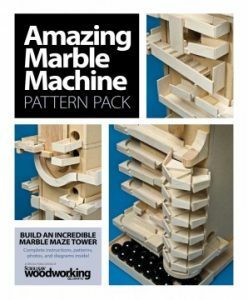 He drilled the holes in the SSWC machine’s body slightly larger than the marble size to account for possible wood swelling and sloped them to ensure the marbles wouldn’t stop rolling as they passed in and out of the machine. While developing a prototype weight for the dump bucket, he counted the exact number of lead BBs required to fill a hollow dowel and create the necessary swing—and then discarded the design for fear woodworkers would have a different type of BB and be unable to duplicate his success with the design. Richard enjoyed a 40-year-long career as an engineer and technical writer for various companies, as well as a freelance engineering consultant. “Mechanical and electronic engineering, and electrical, and hydraulic—I did a little bit of everything,” he said. He remembered a few outstanding projects, including building his own computer from surplus telephone relay equipment, creating a mechanical weather map for a television station, designing circuit boards for the space shuttle, and making a pumpkin-shooting cannon from a 20″-diameter PVC pipe. A tinkerer and perfectionist at heart, Richard noted that he could have made the SSWC machine more complex, perhaps by adding some swoops, turns, or spins to the second track. And, he mused, the corner blocks aren’t quite perfect—later experiments showed that adding a thicker curb would have made the marble travel its path slightly more successfully. But as the marbles rattle down the ramps, around the curves, and through the zigzags and spiral staircase, the machine is both a mesmerizing artwork and a homemade, self-taught example of engineering at its best. 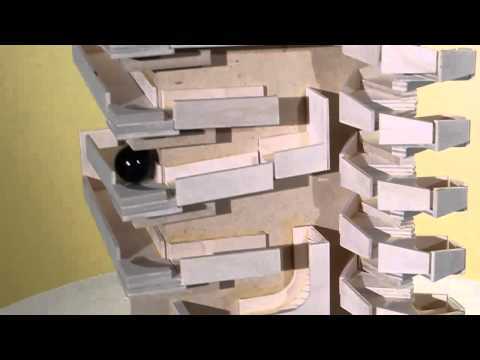 To see Richard Browne’s marble machines in action, check out the video here. The SSWC marble machine pattern pack is available for $9.99. 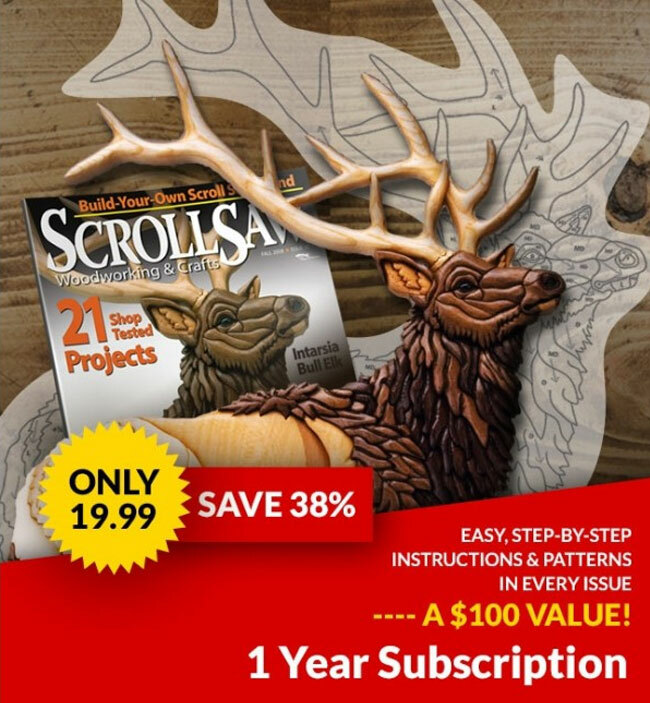 Click here to purchase a printed pattern pack, or to buy the electronic version and start making your own machine today.